Duke Kahanamoku Off to Hollywood, 1936. 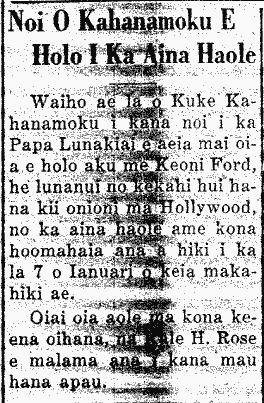 Duke Kahanamoku [Kuke Kahanamoku] submitted his request to the Board of Supervisors [Papa Lunakiai] to allow him to go with John Ford [Keoni Ford], a director [lunanui] of a movie company in Hollywood, to the land of the haole and to take a leave until the 7th of January of next year. During his leave from his office, Charles H. Rose [Kale H. Rose] will take care of all of his duties. Ke Alakai o Hawaii, Buke 9, Helu 33, Aoao 3. Novemaba 19, 1936.